Where was I again? Oh yes, desserts, I promised you one. Its story is simple. Neither fuss nor complication, but a delicious outcome that I am never becoming tired of. I was a young carefree girl growing up in the eastern part of France. Most days after school or during the grandes vacances, my brother and I used to ride our bikes to the place du village to meet our friends under the tall majestic marronniers (chestnut trees) that seemed to have been there for ever. They provided a lot of shade for us to hide from the sun during summer, and in the fall, their leaves scattered on the ground made a colorful bed for us to play on. We loved these trees; they had become our secret meeting place if we needed to have one. Once or twice a week, on the way back home, I would stop to get fresh milk at Monsieur S.’s, one of the few farmers in the village. I was quite delighted that my brother did not care for it, hence I did not have to take turns with him. I was proud to be the one in the family to fetch the milk. I liked the short walk home carrying my bidon (pail) full of milk in one hand, pushing my bike with the other. The milk felt warm when it brushed my leg, and I imagined all the good things my mother was going to prepare with it. A bol de chocolat chaud was the first thing I was looking forward to. “Tu vas faire des crèmes vanille chocolat en dessert ?” (Will you make vanilla and chocolate creams for dessert) I often asked my mum once I was back home. She would look back and smile. She knew it was one of my weaknesses. Hence it is perhaps the first dessert that she taught me to make: simple and comforting. Since then, I have not grown tired of it. Indeed, dairy products stand out as different, as I am reminded every single time I go back. 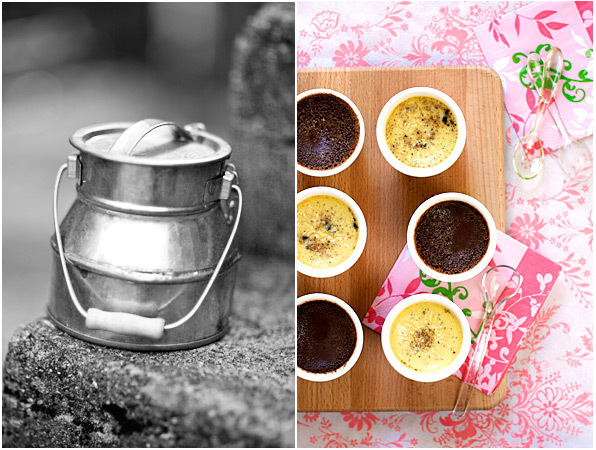 The French really love their dairy products, yogurts and crèmes desserts, including petits pots de crèmes. And they know how to market them well too. Walk into any French supermarket and visit the refrigerated dairy section, and you will understand what I mean. Lines of dairy products — fruit yogurts with beautiful flavors like rhubarb , lemon or apple (a few of my favorites), flans of all kinds, silky fromage blanc, creamy petit suisse, flavored mousses, delicious soy products too — are nicely packaged, cleverly marketed for easy customers victims, like me. Some look modern and new while others have an old-fashioned (à l’ancienne) flavor, as if they had been made in the old days. How could I resist yogurts made by companies like La laitière or La Fermière coming in glass or pottery jars? Every time I return from a trip to France, my collection of glass jars keeps increasing. So naturally, I make petits pots de crème often since I am somewhat frustrated with the selection of yogurts and crèmes desserts I find in American supermarkets. In this recipe, I use what I’ve been taught when I started to prepare this dessert as a child, but I also add a twist, varying the quantities and ingredients. And since I could not decide between chocolate and vanilla, I made both in the same batch, solving my common indecisiveness issue. 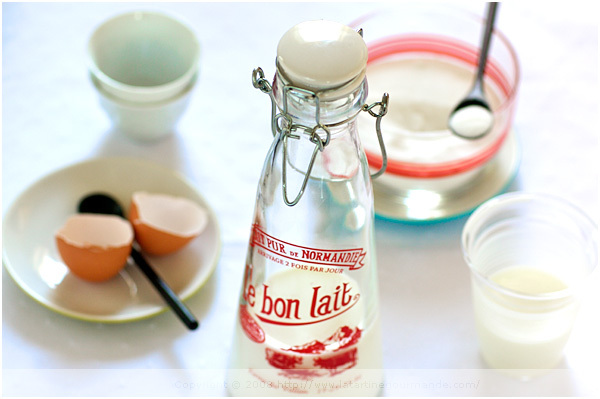 When I want to stick to the classic French recipe the way I’ve learned, I use milk. Some people will tell you that they also like to combine cream to milk but in my case, I prefer to keep the dessert on the lighter side, hence I only use milk. In more recent years, I have also enjoyed using coconut milk combined to soy milk. Either way, the outcome is delicious and tastes as I fondly remember. Then, there is also the recipe for the chocolate coconut pots de crème I’ve made a few times, one that has become a favorite too. But we should start with the beginning, and talk about the first recipe first. In a pot, pour the milk and add the vanilla bean and seeds. Bring to a boil and then stop the heat, cover and let infuse for 30 minutes. Filter. In the meantime, melt the chocolate in a double-boiler and keep on the side. Preheat your oven at 320 F.
In a bowl, beat the eggs and egg yolk with the sugar, then add the hot milk slowly while beating. Divide the cream in two equal halves, and add the melted chocolate and cocoa to one half. Pour the vanilla and chocolate creams in small ramekins or jars — make sure to remove the foam that might have formed on top — and place them in a dish filled with hot water, so that they are half immersed. Place in the oven and cook for about 30 minutes (for the chocolate creams) and 35 to 40 minutes for the vanilla creams. Check regularly after 30 minutes. The middle of the creams should still be moving a little — the creams will settle once they cool down. Take the jars or ramekins out and let them cool down. Place a plastic wrap on top and place them in the fridge to rest for a few hours before eating. Then, simply enjoy whenever you feel like it — that is often! Faites bouillir le lait avec la vanille fendue et grattée. Arrêtez le feu et couvrez pour laisser infuser pendant 30 minutes. Filtrez. En attendant, faites fondre le chocolat au bain-marie et réservez. Préchauffez votre four à 160 C.
Dans une jatte, battez les oeufs avec le sucre pendant 1 minute, puis sans cesser de battre, versez le lait chaud en filet sur cette préparation. Divisez la crème en deux et ajoutez le chocolat et le cacao à l’une. Versez les crèmes parfumées dans de petits ramequins, en prêtant attention à enlever l’écume formée à la surface, et placez-les dans un bain-marie (eau chaude à mi-hauteur). Cuisez au four pendant 30 minutes pour les crèmes au chocolat, et 35 à 40 minutes pour les crèmes vanille. Vérifiez vers 30 minutes de cuisson. Les crèmes restent tremblottantes quand vous les bougez deoucement — elles se solidifient en refroidissant. Sortez-les du four et laissez-les refroidir avant de les filmer, et de les mettre au frigidaire pendant quelques heures. Puis degustez à volonté, c’est à dire souvent. Wow…expats really share the same brain…or close to it! I just posted about a petit suisse experiment I did with Aran, and now you are making me crave Danette!! I also brought back my milk pail from when I was a kid!! The pictures of the table setting toward the end are so full of life and very story-telling. Wonderful! That carafe is adorable! You always have the best prop…oh you Master Bea!! Mmmm, I haven’t made pots de creme in about a year, mostly because the wifey was pregnant and avoiding egg products, but this post reminds me that I must make some again. Mmm, cardamom pots de creme. La Laitiere- I miss it! I may try these pots de creme with some lemongrass. J’ai publié auhourd’hui sur mon blog tes tartelettes aux fruits de la passion et chocolat… ces petits pots de crème pourraient également très certainement s’y retrouver un jour! j’adore ces petites crèmes, ça fait tellement longtemps que je n’en ai pas faites mais tu m’as redonné envie d’en faire ! et quelles photos ! So true…I am always amazed at that section, with yoghurts and desserts in lovely jars and pots!! I just love that milk bottle and the gorgeous little pots, yellow orange and green ones, are they yours. En Allemagne, les rayons des produits laitiers sont remplis de yaourts, semoules et autres pudding mais point de petits pots de crème à la française. Alors, j’en fais à la maison quand La Laitière me manque trop! Je vois que toi aussi tu as craqué pour ces jolies bouteilles de lait en verre…J’ai moi aussi succombé à leur look so old fashion! I want to eat my computer. This looks heavenly! I recently posted on creme brulee but did not address the “French Factor” in sourcing dairy products. There is no comparison between what is available in the US and France in terms of dairy product. All ingredients can be the same but the dairy aspect in France is simply ethereal. You have done such a marvelous job describing and presenting this. A true pleasure to read! They now have ‘macaron-flavored’ yogurt, too here in France. I haven’t tried any….and don’t plan to. I’ll stick with plain, thanks, and eat my macarons another time! Pots de creme is seriously one of my most coveted desserts. Yours are stunning. I cannot wait to try them! Wonderful post ! This blog always makes me dream ! I like your rainbow colours spoons. They are so lovely and brightens up everything! Yum, yum, yum. So creamy and delish! Bea, I am sharing your passion for dairy… I have been on a dairy kick lately as you might have noticed by my obsession with petit suisse. I can’t get enough of it. You are a true master in creating a mood and nostalgia which I am also drawn to. Beautiful, beautiful post! J’adore ces petites crèmes, surtout qu’elles sont légères et quand même délicieuses, j’en suis certaine. Love the styling. Where did you get the jug and the cups? Je viens tout juste de faire la recette et c’est divin! Je n’aurais jamais cru que du lait demi-écrémé et des oeufs pouvaient être si cremeux!! Merci! 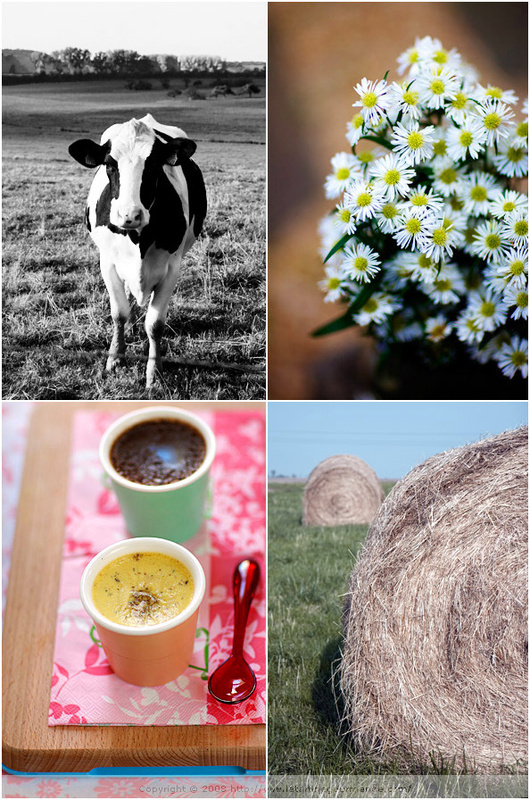 je craque pour ton blog, c’est une merveille, tes recettes et les photos sont si belles ! chapeau ! 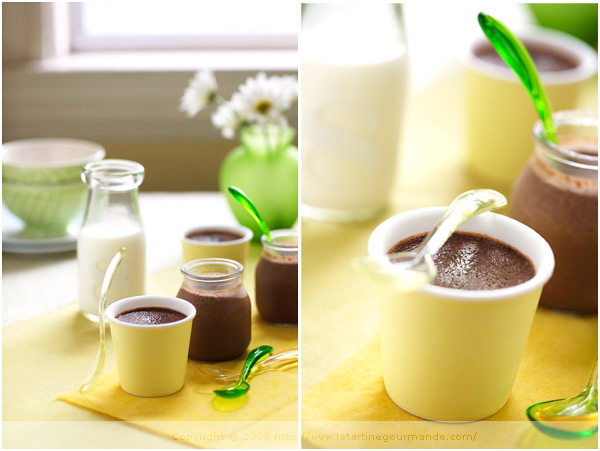 i have never tried making pots de creme and am very excited to try this recipe! this may be a silly question, i notice many of your recipes call for blond cane sugar… is this something more than regular cane sugar? I completely understand …. I am so disappointed in the products in the states as well. I eat gallons of yogurt when we are in France – LOVE IT! By the way, where did you get the cute little containers for yours? I have been looking for some that are not basic ramkins, another hard thing to find here. Your photos are beautiful. I can’t wait to try this recipe! next time i’m back in france, i’m going straight to the dairy section! you paint such a lovely image of it! and these pots look so delicious and i can’t wait to try them. Je viens de decouvrir, ton blog, par ton article sur les machines a pain ! Me dire que mes filles,ne peuvent decouvrir toutes ces saveurs cremieres me brise le coeur! Merci pour la recette.. I feel like jumping on a plane to France with an empty suitcase, load it up with the best dairy products from French supermarkets and the most beautiful glass and pottery jars, and then flying back to Australia. Well maybe not, but when I go, I’ll be sure to visit one (or ten) French supermarkets and load up on those lovely things!! What a FABULOUS blog. Love your style. Ciao! A few answers here and there: the glass jars are from recycled yogurts. The colored ones are from ASA, and the jug was bought in Ireland, from Avoca cafe stores. It comes from Copenhagen though. I hope you like the pots de creme. And for those who already made them, I am glad you did. Thanks for giving me feedback and sending me emails! Sorry if I cannot respond as much these days, hopefully quieter around here soon. OH! these are so wonderful…the first thing I do when i get to paris is stock the little fridge with yogurts and little cremes. I love them and I love and save all the little glass jars! They are my weakness. I keep my beads in them! Thank you for the beautiful photos and recipes! What a beautiful post! Your storytelling skills are remarkable and photos always so lovely. Thanks for sharing. I remember drinking milk in Paris (and in Berlin, for that matter) and feeling it incredibly thicker than the milk I have here in Sao Paulo. Your desserts are a feast for both the eyes and the palate, Bea! I’m back in France this summer and the dairy aisle is my favourite hangout. The creamy textures of yoghurt and cream desserts is my favourite texture. frustrated with the selection of yogurts and crèmes desserts I find in American supermarkets. that I agree with you ….. 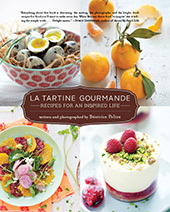 Absolutely beautiful photographs and presentation with wonderful recipes. C’est formidable! This sounds heavenly! Anything cool and creamy is the perfect antidote to summer heat! oh wow, those look just to-die-for! Those little pots are just fabulous, too! 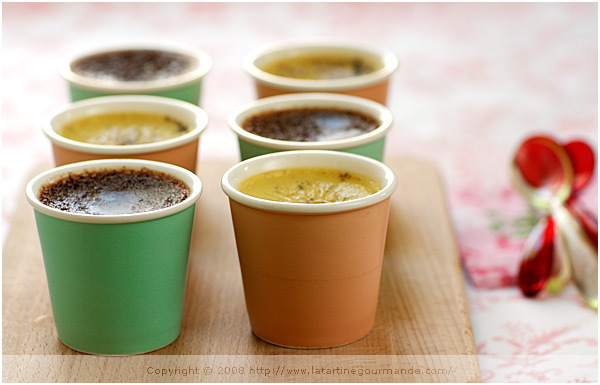 I was wondering where I can purchase pretty pots de creme pots such as these. I am having trouble finding “unique” pieces and have only seen the basic store-brand styles. I live in the state of Pennsylvania, USA. Any suggestions would be of great help! Your site is really beautiful and insightful! These are my favorite types of desserts! I love your colorful jars! Just ran across your blog about the french yogurt, recipe for the pots de creme and your use of the jars that the french use for their yogurt. First I want to to tell you that I am impressed with your photography, variety of recipes, and am looking forward to trying out some of them. I wonder, if you have quite a bit of those french yogurt jars if you’d be willing to sell 8 pcs to me. Really like them! Please let me know. 360-504-0212. Oh my…I tried this recipe over the weekend. It’s fabulous and the entire family loved it. Thank you for sharing. I came to your website with a search for pots de creme. Your pictures are amazingly beautiful, what a wonderful blog you have! May I ask you where you got these lovely pots you used for the pots de creme? They are absolutely fantastic! Where did you find those beautiful custard cups? How beautiful the photos are! I remember falling in love with the French yogurt and cream (I was trying to figure out how to even bring the beautiful yogurt containers that they came in!) Would you please share where the pot de creme cups and glass yogurt and milk jars came from? Are they available in the US? Thank you! Your photos are so beautiful! It makes pots de creme seem romantic some how. Thanks for sharing! I love the little La Latiere yogurts in France, coconut, lemon and vanilla. My Belle Mere makes delicious tapioca with milk, vanilla and eau de fleur d’oranger which I make at home a lot. I also discovered La Faiselle which we ate with my Beau Pere’s honey or creme de marrons maison. The French are indeed great with dairy products! Agreed–these little treats and the photos are inspiring. Just read the recipe this evening and made it immediately. Rich, creamy and luscious chocolate recipe and I’m sure it will be a hit with my friends as well. YUM! These looks fantastic… You have been hiding wonderful tid bits like this for how long?? Can’t wait to start this one, please post more! Encore! Pingback: weekend’s here. « Little Me, Big You. Béa, where did you get those lovely little cups? You always use such nice props! Marie, merci. The cups come from the company called Asa. Oh my… I shall try this recipe very soon!!!!!! I am reading your blog for the first time and I’m loving it! The vanilla pot de creme was super delicious, light and milky, and vanilla-y, I preferred this over cream. The chocolate was too dense for my taste, very rich but just the right thing if you’re looking for a rich dessert. Am trying with two teaspoons of cocoa powder and no dark chocolate at this moment, hopefully to keep the light texture. Bea, i have a question. are those paper/cardboard cups in the picture? were you able to bake with them in a water bath? just curious, because that would make it possible to make a whole bunch of them without having a whole bunch of petit pots.. They are actually ceramics. You would not be able to bake in paper cups in a water bath, unfortunately. What is the brand of ceramic cups? I have made pots de creme for 30 years, and never seen a prettier serving dish. Lovely. I made these and they came out really delicious! They did take a longer while to cook than the recipe stated and the chocolate ones came out a bit less firm than the vanilla ones because the chocolate floated to the top, (and made a delicious chocolatey layer on top, haha) probably because of not mixing well enough. My vanilla pod speckles also sank to the bottom of my pots. But I loved it and will be making these over and over, thank you! What can i substitue the vanilla beans for? Can i use vanilla extract? Nicole, yes. Sure. Use pure vanilla extract. 2 teaspoons, (or more or less) depending on how much vanilla you like. Converting the 50 g of choc–is that about 1.79 oz., and can you use granulated sugar, raw sugar or light brown sugar in place of the blonde cane sugar? Really enjoyed your post about your French past. I am from USA but I’ve been making yogurt and now can hardly bear the commercial yogurt. They don’t taste the same at all! Hi Barb, yes 50 g would be 1.76 ounces, and you can surely substitute the sugar as well. Hope you like them! It was my first time making pots de creme. My execution was less than perfect, but the recipe was very forgiving, and the petits pots turned out heavenly, with an incredibly creamy, smooth and delicate texture. Thank you for sharing this recipe and some very beautiful memories with us. I made these as the dessert for a Portuguese dinner. Absolutely lovely! Raspberries and fresh cream on the side. Had to tweak the cooking times though as my oven is a bit wonky. My question: if I wanted to make only the chocolate creams – how much more dark chocolate and cocoa powder would you suggest? Thanks for a great recipe! Hi Jackie, lovely to read your enjoyed the recipe. If you wanted to only do chocolate, double the quantity of chocolate and cocoa powder as the recipe served for half vanilla, and half chocolate. Let me know how it goes. Merci! 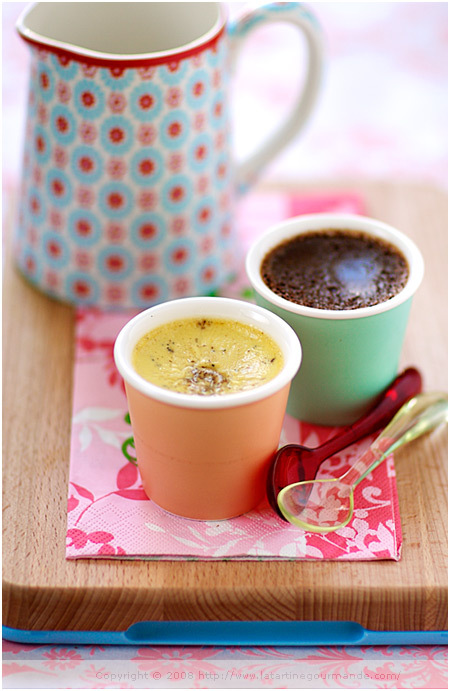 Would like to use real pots de creme pots with lids, but am having trouble finding them. Neither Williams Sonoma nor Sur la Table here in California have them. Any suggestions? LOVE your beautiful soft-hued lidless ones in the photos! 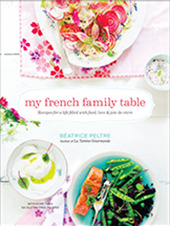 A friend just gave me your cookbook–lovely recipes and lovely photos! So far have cooked the Spaghetti with Crab and the Raspberry Cremes, both superbe! I just made this recipe and i’m in love with it. Expecting my kids from kindergarten any time and i know they are going to get crazy. Thank you so much. I will be visiting you! Sands, thank you. I replace 1 cup of milk or heavy cream with coconut milk. Quelle coincidence, j’ai justement fait cette recette depuis le livre la semaine dernière. Par contre, en dégustant, je me suis dis : Mais c’est des Oeufs au lait! Est-ce que je me trompe?? Pingback: Salty Honey Pots de Crème - Apples Under My Bed - A food diary. where did you get those black spoons?